If the world could be ordered to my specific tastes all books would be available in audio format and all of those would be read by people with Scottish accents, even the ones set in outback Australia. I blame my mother’s crush on Sean Connery (and the fact a portion of my developmental years was spent in darkened theatres watching his movies instead of going to kindergarten) for the fact I find it the very best way to hear English spoken. 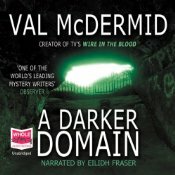 I was pre-disposed then to liking A DARKER DOMAIN, one of Val McDermid’s standalone novels, given it is narrated by Scottish actress Eilidh Fraser. Happily the story is a damned fine one too which made my listening experience complete. Being something of a latecomer to the Val McDermid appreciation society I was, once again, impressed with the superior storytelling skill on display in this big novel that a lesser author probably couldn’t pull off. It opens in the contemporary setting of the Fife Constabulary cold case unit. DI Karen Pirie is asked to track down Mick Prentiss who has been missing for more than twenty years, since the brutal miner’s strikes of the 1980’s when he was thought to have gone to work as a scab in Nottingham. But now that his daughter is desperate for a bone marrow donor for her very ill son she cannot find a trace of her father and turns to the police for help. At the same time Pirie is given a much higher profile missing persons case to re-open. The local laird is Broderick Grant and twenty years earlier his only daughter and her baby son were kidnapped and held for ransom. However the exchange went horribly wrong which resulted in the daughter’s death and the grandson’s permanent disappearance. Now a journalist has found some evidence that provides a concrete link to the old case and Grant wonders if he can find out what happened to his grandson once and for all. These historical stories unfold concurrently throughout the novel, often hinting at how they will connect but I’m sure (at least I hope) I’m not the only reader who made several errors of guesswork before stumbling across the actual connections. McDermid really is a master of this kind of twist-filled plot because it is, at least until just before the end, continually surprising while maintaining a credibility that is often lacking from this kind of book. But underneath the rollicking plot there is a real depth, particularly as McDermid describes life for the striking workers and their families. This is a subject I’m not terribly familiar with (in my defence I was 16 at the time and lived half a world away) but the details of day-to-day life included here had a very authentic feel to me. The real poverty being experienced by the striking workers, their disappointment in the strike’s leaders, the good and bad sides to the power of the local community are all deftly depicted and really made me feel like I have some small sense of this turbulent period. I’d recommend the book for this if nothing else. The characters in the book are also enjoyable to meet, even the unpleasant ones like Broderick Grant who uses his money and influence in the way that such people often do. There are two strong female characters though in Karen Pirie and the journalist involved in the Grant case, Bel Richmond. Pirie is particularly engaging as she is constantly skating on thin ice with her superiors but because she has a history of good results she gets away with most of her unorthodox behaviour. And she does have a good offsider in DS Phil Parhatka who is, sometimes, able to reign in her wilder ideas. McDermid somehow manages to avoid the sickly sentimentality that could easily overwhelm a book that tackles the kind of emotional storylines and themes as this one does. The undercurrent of dark humour probably helps, as does its almost entire lack of judgement about the people involved in the story and the actions they take. The more I read the more I realise just how rare a thing this is and the more I am grateful for those books which achieve it. This entry was posted in book review, Scotland, Val McDermid. Bookmark the permalink. I’m a sucker for a Scottish accent too so I can see why that would influence you. But, this sounds like a wonderful book. I can hardly wait to read it. I’m so glad I’m not alone with my fetish for Scottish accents – most people here think I’m strange. Great review, Bernadette. I think this is one of her best books. The others she wrote around that time are also very good – her last two or three have been a bit too commercial for my taste, compared with the more intelligent slightly earlier ones. I too love the Scottish accent of Sean Connery. When I was young I used to see his films, which often weren’t very good (but at least they were different from the usual Hollywood rubbish) just to see/hear him. (He always turned in a good performance.) James Bond was never any good once he stopped. I do so agree on the Bond issue – I’m not really a fan of any of them but I can watch (and listen) to the Connery ones. Bernadette – I love Sean Connery’s accent too! And I agree with you that McDermid is a fine storyteller. One of the things I like is her skill at weaving together past and present. And thank you too for mentioning McDermid’s ability to discuss difficult, controversial and and emotional issues without making the reader feel emotionally blackmailed. It’s very hard to do that. So do you have the tv show Taggart Kathy? it’s a police procedural series set in Scotland – I love to watch (and listen) but I imagine it might be a problem for Americans???? I have this on my shelf to to read. Thanks for reminding me. I prefer VM’s standalones to the series. I must try and read it sometime. Like Maxine, I think this is one of her very best books. The plot, the setting, the characters, and as you say, her description of the miners. Well, who could ignore these raves? Not I. I am muddling through White Heat, the very book critiqued here, and trying to see if it works for me (aside from the seal meat, which made really send me to vegetarianism). I’m giving it a good try. Well, I read Val McDermid’s website section about this book and her own family history with grandfathers who were miners and some of the sad things that happened. I will read this. On another note, I don’t believe Taggart has shown here, however, being undaunted, I checked the library’s catalogue, and it shows several episodes on dvd.– and there are English subtitles, if needed. So, this will definitely be on my coming viewing schedule, and if I have a week to tune out, I’ll get a series worth of the shows. The show is quite good Kathy although it does wax and wane a bit in quality – it has been going for a very long time (25+ years I think though only a few episodes each year which is the way that UK series tend to be rather than the long seasons of American shows) and as you’d expect some episodes are better than others. But the accents are strong! Great review Bernadette (I’m using the public holiday to catch up on some blog reading). I will also add A Darker Domain to my reading list. I like a lot of Val’s books, especially The Grave Tattoo, and I had the thrill of meeting her when she was in Melbourne a couple of years ago for the Writers Festival. Such a warm person. And I find the Scottish accent seductive, too. I love the image of you skipping kindergarten to watch Sean Connery movies. What a well rounded education you had.